Old Path: Tiny old axe, or a hatchet if you prefer. 4 days ago, i found a few old axe heads, from an old shack belonging to my work buddy. 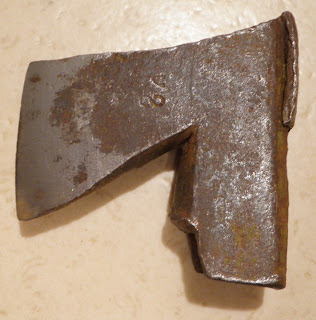 Among em were Billnäs, H.B etc, but what i really found interesting instead of those that i already own many pieces, was this small, very small in my mind, axe head. I have absolutely no idea of its trademark nor maker. It weights 409 grams. 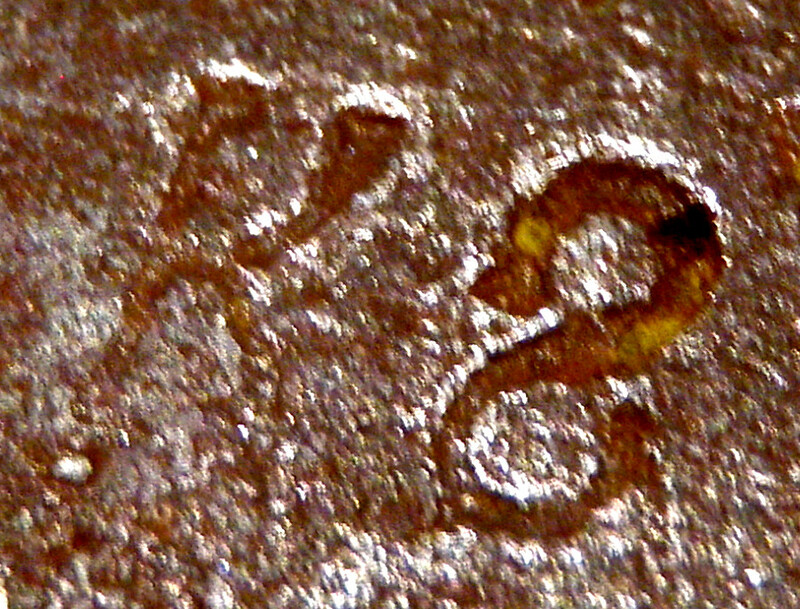 It has a stamp , that looks like K and 8 or K and S upsidedown.... but the 8/S looks bit odd. I believe they are markings made by the maker of this as they are only ones and done with stamp tools that are old, looking by the style of the letters. The head is not machine forged in to mold. 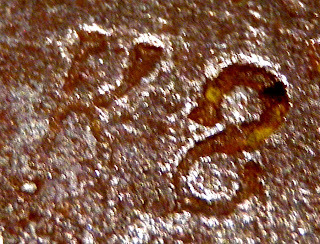 How ever it might be made in mold but with human operated hammer, as the forging marks dont look like machine made at all. I was pretty happy to see that it has a forge welded edge between the rest of the material, it can me seen as visible welding seam, and as i sharpened it with water and stone, the actual edge came mor evisible and polished bettet than rest of the head. I´ll be adding mor epictures to this post what i can, i am having quite hard times with computer as the one that i waited for long sadly was a piece of s-it, as its hard drive wont co-operate at all, so i am using again the loaned P.O.S from my buddys sister, and this is slow one from stoneage. 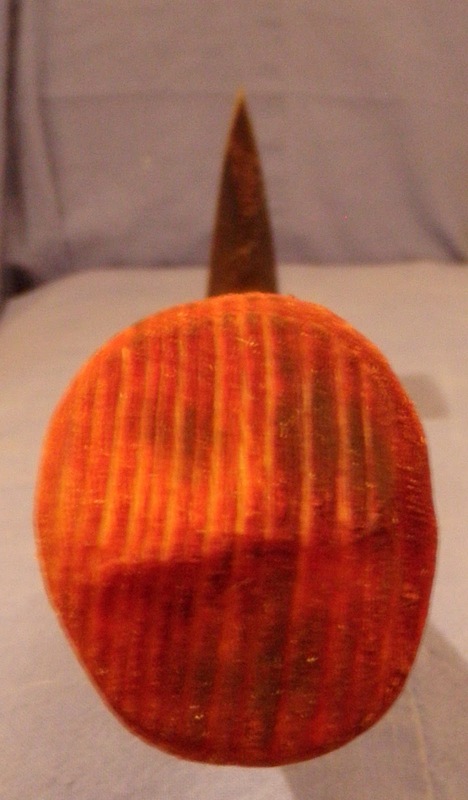 Well, i used a steel wire brush to clean most of the rust off this head, after i held in in lamp oil over night. 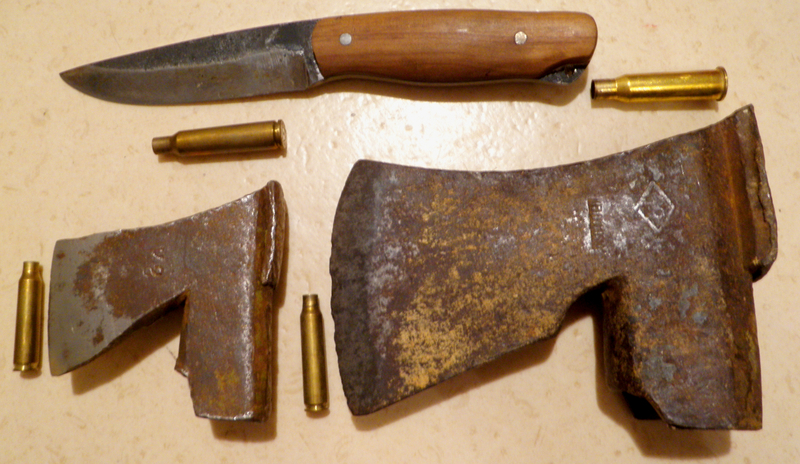 Then i filed some off the worst nicks etc off from it, and thought that i´d put this in to my cheast of old relics and treasures as this sure aint the most commonly found head, atleast these days, so its also maybe a future collectors item. 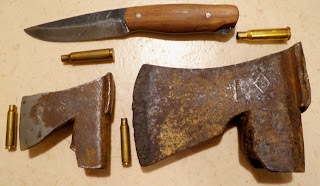 Maybe you wont do 16 true (not thrown piles) cubic meters of firewood, with this axe heads help and get rewarded with gold plated axe head pin, like many did during our tight years, including my grandpa who had loads of these, black, silver and golden ones. THESE DAYS YOU CAN HELP OUR WAR VETERANS BY BUYING THESE PIN REPLICAS. Dont whine about price, its for helping out true heroes of our nation. Then i thought again....what an earth....i´d rather treat it that show it. 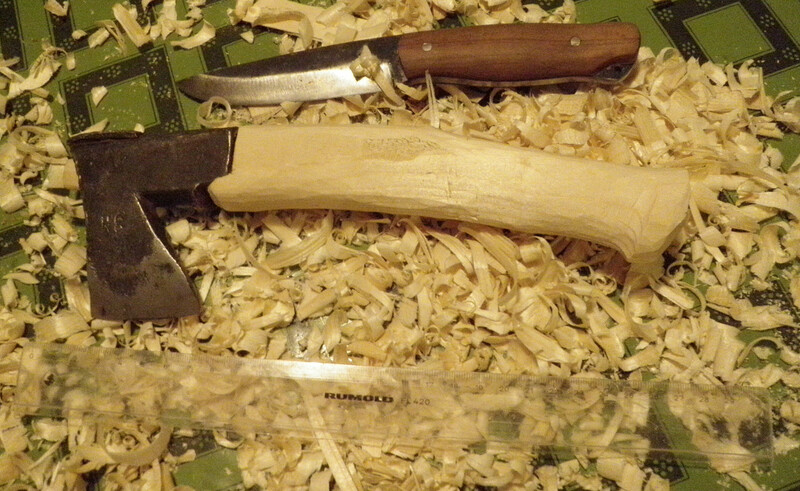 So i made a simple short wooden helve to it, or do you say handle or what ever. 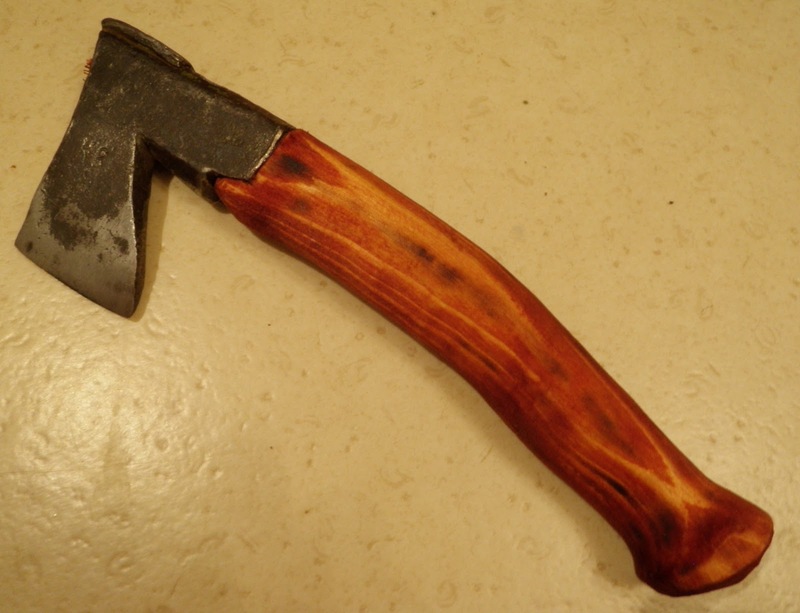 I am not an axe geek so excuse me while i use wrong words in english. 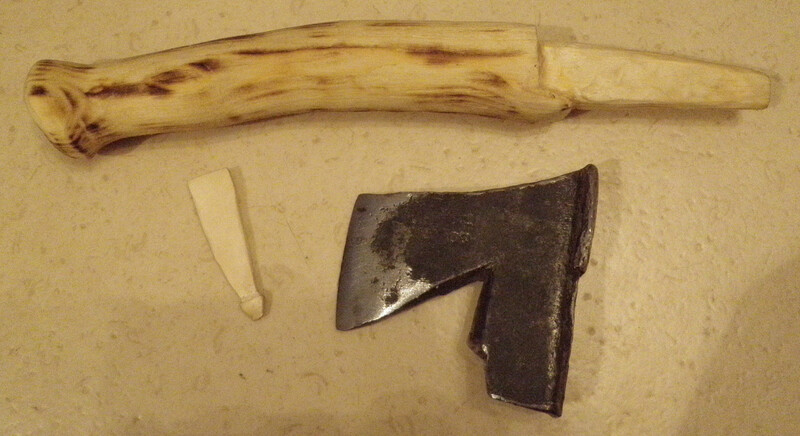 I cut the coarse blank to work with, with a jigsaw, it was about 5cm x 5cm and some 30 cm long. 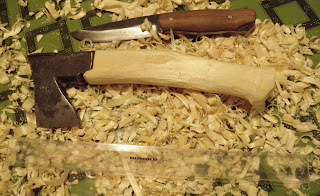 Then i made the rest usng my BushProwler. 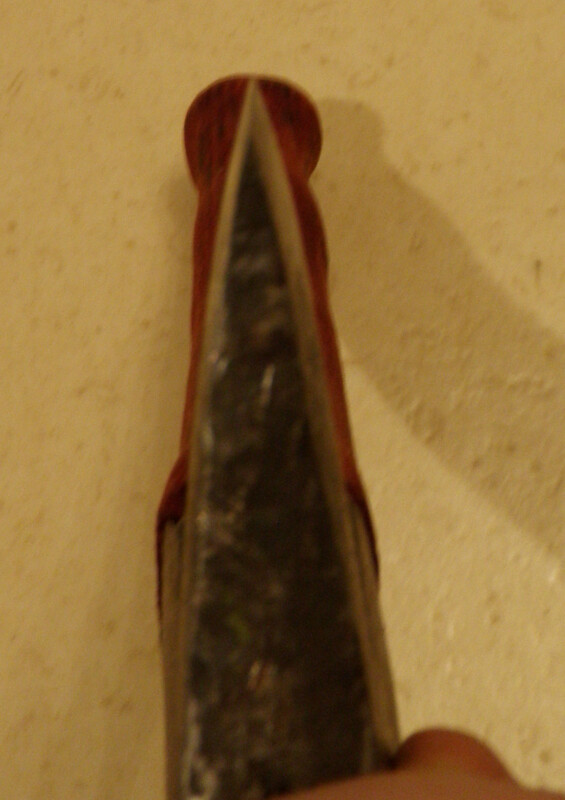 No sanding, no rasping, just knife finished and scraped finish, topped off with candle flame and linseed oil mixed with three-four tearfulls of leather dye. 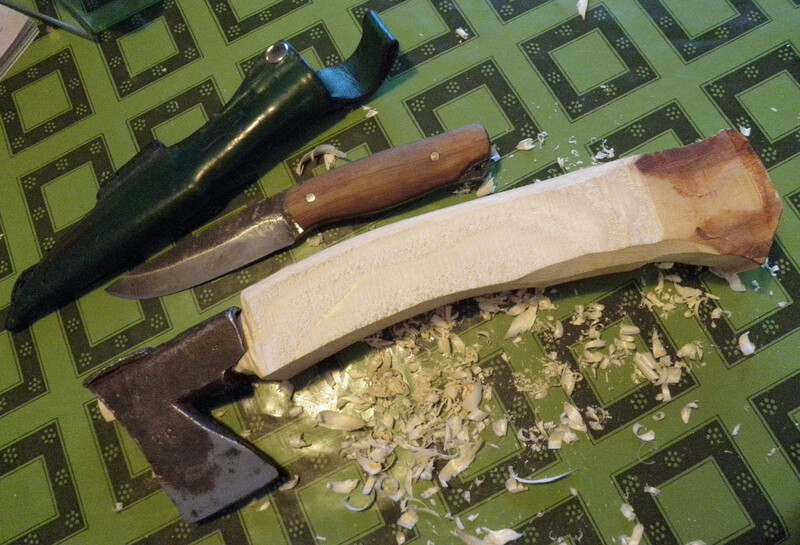 i used a small wedge, commonly used in Finland, called "snake wedge" as well as tar / sand mix (common trick atleast here), to lock up the head in to the helve, that i whittled as tight as possible so that the last about half of the heads eye was almost beaten to the helve. I think, that for a test helve, it became satisfying, and if it does not work, its just a few hours of work to make a new one anyways. 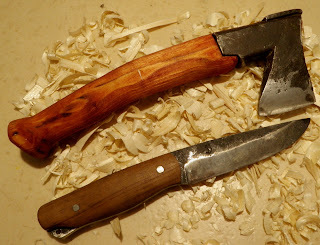 Ive been lately enjoying an argue about axes in general woodmen use in the forum, and there seems to be about just me and one other guy who sees the thing so, that the tinier hatchets / axes really are enough in real world use, today. No, i dont mean felling 8" trunks to ground, and processing em to stuff used for heating uo your cozy little stove at your living room. I am talking about Finnish outdoors use all over the country. If you are lucky to have a camp in your own7relatives/etc woods, where you can campcraft all you want, bucking trees etc, then it might be good to haul around a big lumber axes. But in my reality, i can hike around this country, and gather small woods, and do campfire´s, to cook as well as for warmth, with "just" an smaller one. In ntaional parks, there are rules and regulations as well as usually either branches etc in the ground and pre-made wood material. In areas wher ei have land owners permissiont o make fire and craft around, i dont Really need to buck down a trunks bigger than 3 inch diameter for campfire of any kind of shelters, as i m not there to build log houses. But what ever, everyone goes with what they want. And i am not saying Now, that this kids axe would work at all, thats to be seen at next week, but in generally, i think small tools are very usefull, as well as compact to pack, ligther to carry, and offer better performance with small works. Ive been drooling over few small axes (they are all xes here, we dont have a single word for small ones, like hatchet) like Granfors Mini Axe and Gubben, Wetterlings Small Axe, but they are pricey now for me, and i do have to say that the looks of my new small axe are something i like, they are familiar and traditional in my country. Well, i l do another post of how it works as soon as i can.